I think we all know that pirates are kind of an interest for me. So naturally I was intrigued by the prospect of a sequel to one of the great classic pirate stories, Robert Louis Stevenson’s Treasure Island. Often I have big objections to sequels to classics, but this particular classic falls into a nice middle area, where I’m interested, but I’m not so attached that I hold it too sacred for a new author to attempt a story. 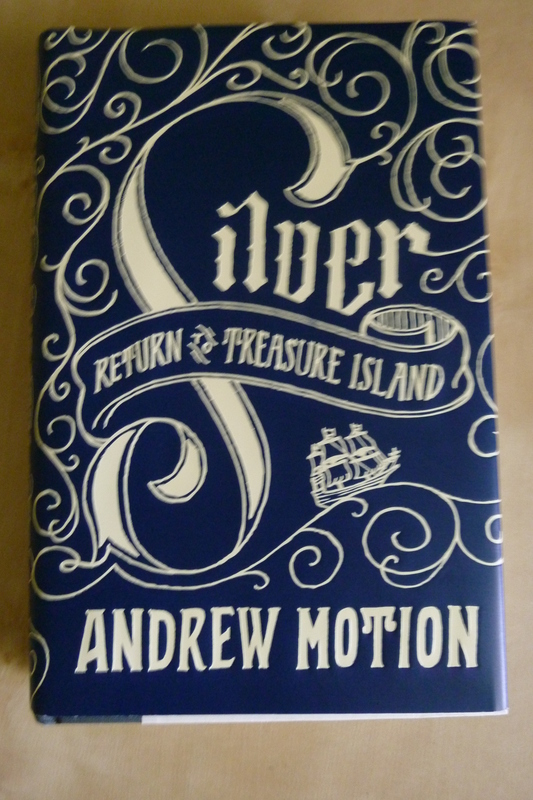 Silver: Return to Treasure Island by Andrew Motion is told by a different Jim Hawkins, the son of the original. This Jim is eighteen years old and thoroughly sick of his father’s stories about his glory days on Treasure Island. Nevertheless, he can’t resist following when he’s approached by Natty, the daughter of Long John Silver. Natty’s dying father has prepared a new expedition to Treasure Island. Jim steals his father’s map, and he and Natty set off, hoping to find a cache of silver that the last expedition left behind. What they find are ghosts of the past–the nephew of a man the original Jim Hawkins killed; three pirates marooned by the last party, now inflicting barbarities on a group of castaways; and always the looming memories of the first Jim Hawkins and of Long John Silver. The writing is excellent here. There’s a formality to it that harkens back to the original book, without going too far and sounding stiff to a modern audience. There are wonderful descriptions, particularly of nature, which is described not only in terms of appearance but very much in mood, sometimes being almost anthropomorphized. Jim (the younger) is a thoughtful character, who explores his own feelings and motivations, and makes interesting observations on other characters as well. Natty is a wilder character and harder to read, but there are glimpses that make her engaging and demonstrate her complexity. We only get a little of Jim the older, and of Long John Silver, but something interesting happens with them. I feel I have to give a little context here–in almost every adaptation I’ve seen, there’s a complicated relationship between Jim and Long John, a love-hate situation where Long John plays almost a fatherly role. In the original, Jim pretty much sees Long John as a devious pirate and it’s all much simpler (and less interesting). Here, Jim describes the relationship as the book tells it–but Long John seems to remember it as the more complex relationship that we see in adaptations. It’s an interesting balance. The adventures in the book are tense and exciting. There are stretches that are quieter, but the action is good when it comes. This gets pretty dark in spots, but never quite goes too far. It’s obvious there are very horrible things happening on Treasure Island, and there isn’t much doubt about what–but we never got it in such detail as to be too awful. It does edge up very close to a disturbing area though, so reader beware! There are also some hints at the very beginning of something quite odd in Natty and Long John’s relationship, but that’s never elaborated on–which to be honest, I thought was just as well! I did think the book mis-stepped in other places by not elaborating, as Motion mostly avoids the thornier issues. Long John Silver is married to “a colored woman,” I think based on a reference in the original book, which means Natty is mixed race. In 1802, she would have faced enormous prejudice because of that; here, it’s skated right past. When Jim finds out, he remarks once that it doesn’t change how much he’s drawn to her, and that’s all. While that’s certainly admirable of him (by modern standards), it feels anachronistic. History’s attitudes may disturb a modern reader, but this reaction in a young white man of the early 1800s makes Jim almost impossibly progressive. The situation is similar when slavery comes up (and it plays a significant part in the plot). All the good characters are apparently abolitionists, with no need to even discuss the question–even though this is five years before England ended the slave trade, and 30 years before slavery was outlawed in the British Empire. Of course I don’t think the immorality of slavery is a complicated question, but it should have been a complicated one for characters living in 1802, and I think Motion oversimplified. I won’t say that the simplification spoiled my reading of the book by any means–but I think this was a good book that had the potential to delve a little deeper, and in a way that would have been more realistic. Disclosure: I received a copy of this book for free from the publishers in exchange for an honest review. Sounds like this sequel is worth reading! It takes some talent and imagination as a new writer to produce a credible sequel to a beloved classic. I like your insights on some points such as the characters’ clear stand on slavery and Jim’s apparent ready acceptance of Long John Silver’s mixed race wife. Those are details a reader might skate past, but they are weaknesses if the author is trying to be true to the way characters would think and feel in a completely different era. Still, it sounds like it’s a good effort to continue the saga from the original tale. I read Treasure Island earlier this year and really enjoyed. May have to keep this book in mind.